The 2018 Mustang Rally of the Finger Lakes information, online registration page and registration materials have been posted. The show (and parade) is Saturday, August 4, 2018 at the Phelps, NY Community Center. The Poker Run is back again on Sunday, August 5, 2018. This is the 10th and last year of this local Mustang car show in Phelps, NY. The organizers announced at last years (9th edition) show that this year would be the 10th anniversary and the last show. It will continue only if a new organizer(s) take over the show. I for one really enjoy the local nature and small setting of this show. I also like that it is for Mustangs, and I really enjoy the small town setting of Phelps. My wife and I have also enjoyed the parade. 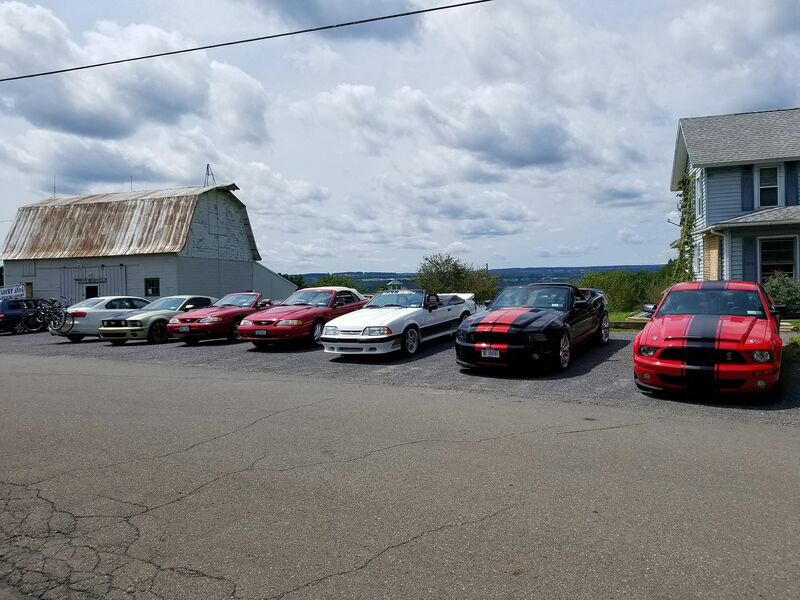 While not many participate, last years (2017) Poker Run was exceptionally enjoyable, with 6 cars sticking together the entire 125 mile run, taking turns leading and getting the entire caravan "lost", and enjoying an absolutely gorgeous sunny day driving through the Finger Lakes country. I hope this is not the last show, but how about coming out and supporting this local Mustang show for its 10th anniversary (and potentially the LAST time). Unfortunately I'm not going to make the final show. Its a shame that this show is being discontinued. I agree it was a nice show, not a huge show but it had a nice feel about it. I had so much fun over the years coming out to Finger Lakes with friends, doing Watkins Glen, hanging out by the lake, etc. It was a very fun getaway. I appreciate everything the committee did over the years. There are not many Mustang shows in upstate NY and this is going to be missed. I wish our local club would take over but I doubt it. However if someone does take over, I think it needs a little shake-up. Based on all my years attending, this would be the perfect Rally to me (coming from an out of towner). First, I say separate it from the Sauerkraut Festival, not only due to Nascar conflict and not able to do laps but I think it would make a nice fall show. Friday, do a big picnic at Seneca Lake State Park, then cruise down to Watkins Glen for some laps. Have dinner in Geneva, Ciccino's pizza where everyone can park in the street, very cool. Saturday, do the Poker run or whatever other thing people may want to do while out there (boat ride, wineries, etc). I had never done the Poker Run due to just wanting to get back home. Switching to Saturday would allow out of towners time for that and also builds in a Rain date for the car show. Have the show on Sunday, forget the parade, just have a show that wraps up early so people can get home at a decent hour. And maybe move it to a dealer, perhaps Friendly in Geneva. This way, most everything is in Geneva where people stay and definitely block some rooms at Microtel or something. I used to stay at Ramada in Geneva but it can be a bit pricey and may be sold out. I'd check out other places in Geneva. Microtel is pretty good, there's also a Microtel in Seneca Falls if Geneva places are sold out. It is Nascar weekend. I'm not familiar with that area but the Rally Committee did give me this list of places. I see a place listed for Manchester. Mustang Rally of the Finger Lakes - August 3, 4 & 5, 2018 in Phelps NY, featuring the Rally Car Show and Poker Run. They will have the show next year. The Rally down to Ithaca was a sweet ride.